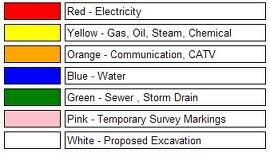 What colors are used when marking utilities? How close to the marks can I dig with equipment? Which utility locating services do you offer? 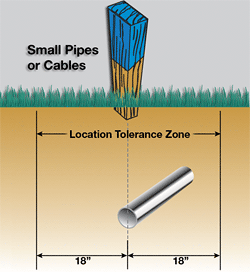 Pipe, cable and tank locating, including, but not limited to: electrical cable locating, communication cable locating, sewer main locating, gas line locating, water pipe locating, storm drain locating, septic systems and underground storage tanks (USTs). Yes. When purchasing an older existing residence we can locate underground storage tanks that were used to hold fuel oil or septic systems that need repaired. We have located drain pipes, electrical lines, water pipes and cable lines for home owners planning on additions and improvements. GPR OneCall is a fully insured utility locating company, carrying $1,000,000 professional liability insurance, commercial liability insurance, workers compensation insurance and commercial auto insurance. Proof of insurance is available upon request. What training do your locators receive? Our Safety and Training page highlights the extensive training that our Technicians have undergone. Our goal is to offer the best quality private utility locating, while keeping our rates as low as possible. Every job is unique and requires our review to determine the appropriate equipment and how many Technicians will be needed. We typically have a two hour minimum charge and we can provide flat fee quote on request. GPR OneCall reserves the right to adjust our hourly minimum and/or rates based on the complexity of the project, distance, increased liability and other factors as deemed applicable. Projects requiring an overnight stay will typically require additional charges. Can you provide a written report about your findings? Yes we can provide a basic written description report for any job if requested. We can also provide photos, DGPS data (+/- 1.5m) and a site sketch (not to scale) but it would add approx $300 to the total cost and we would need to know before the job starts. Normally this is only requested when we are assisting in preparation of a survey or initial site plan. In most cases, as with other environmental jobs we have completed, the surveyor that locates the probe holes, drill holes and wells will also handle the paint mark locating because they will have more accurate DGPS coordinates and then they will be able to map the data to scale on the survey or site plan they are preparing. Are your fees for residential and commercial sites the same? No, residential utility locating is usually less complex, requires less time and generates less liability for our company, and so, fees are typically less for residential utility locating. For residential services, payment is generally required at the time of service. Major credit cards and cash are accepted as payment. Invoices will be issued to commercial clients in good standing, however, payment is considered due thirty days after the date on the invoice. New commercial clients may be asked to provide payment at the time of service. Why do I need GPR OneCall if 811 is available? 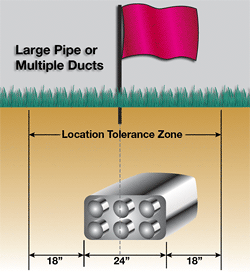 811 should always be called before you dig – it’s the law! However, 811 does not often locate all of your utilities. Once a utility passes through a metering device or other main connection point on your property, it’s considered privately owned and detection becomes your responsibility – this is where GPR One Call comes in. Many industrial complexes have privately owned utilities between buildings that 811 does not locate. By using GPR OneCall to locate these types of private underground utilities you can avoid design issues, large repair bills, unproductive down time and most importantly, prevent worker injuries.